There's a new Firefox add-on that provides a very Web-2.0 savvy way to search. Cloudlet adds tag clouds to your search results through Google and Yahoo. Enter a search term, and above the organic results you'll see a tag cloud, listed alphabetically. If you click one of the tags, it is added to your search query and the results are more refined. At the top left, you can narrow a search by clicking "Sites," which will show you different websites pertaining to your search. You can also click the "Off" button to turn remove the cloud from your search results. This is a pretty interesting tool, fun and quite handy. It's not a bad way to narrow searches when you're not quite sure what you're looking for. And it can be fun to discover new sites and sources not previously known. But what I find truly useful is the cloud as keyword and website research. For example, you might use this tool to find out what's hot in your industry, and authoritative sites on subjects. It might be a good way to find other sites that you want to target for links. Or, if you're getting ready to write a blog post on a topic, you could find some keywords to include in your title or post, or research the topic before writing. The image below is from a Google search for Chicago Cubs. 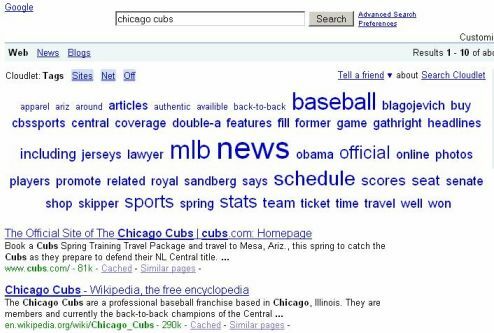 You'll notice obvious keywords like "baseball,"and "mlb." But other tags include "jerseys" and "gathright," who is a new outfielder signed by the Cubs this winter. So, you might consider a blog post about "Gathright Chicago Cubs Jerseys." And included in that post could be a link to Cubs jerseys from your Amazon Associates account.